I gave up on hero worship a long time ago. As much as I love sports and admire pure athleticism, my days of putting athlete’s on a pedestal are long gone. The attention given to celebrities disgusts me. Politicians?—Please. So how did long-time character actor, J. K. Simmons, end up being my hero? One night on a whim, Mary and I decided to watch the film “Whiplash” on Demand because it was getting some attention near the time of the Oscars. I knew virtually nothing about the film except it was about a tough band director and the actor was getting nominated for all kinds of awards for his role. I didn’t even recognize the name or know who he was until he entered the film and I saw the very familiar face that I knew best as Dr. Emil Skoda, my favorite police psychologist on 3 different shows in the Law and Order franchise. Most people who saw the film probably thought, “what is the goofy guy from the Farmer’s Insurance commercials doing in this film?” It turns out that he has quite an extensive background in film, television, and theater, but rarely, if ever, in any kind of leading role. He was once the voice of the yellow M&M in a TV ad. He absolutely killed the role of band teacher, Terence Fletcher. When he walked into the practice room at the beginning of the film, he slipped off his sport coat and as the band came to attention, he extended his arms much like the picture above and I was immediately struck by our similarities. First of all, he was sporting the same haircut as me. Secondly, we both favor black t-shirts. The big difference was, at least in his upper body, the guy was ripped. After the film, out of curiosity, I looked him up and discovered he was 2 years younger than me. Exactly two years younger—we were both born on January 9, along with Dave Matthews, Richard Nixon, and probably several of you. I felt inspired. I wanted to be in that kind of shape. I immediately considered going to the gym and lifting a weight, always the first in many steps of actually returning to the gym. To regain the slender torso that he displayed in the film, I promised to cut back on my beer consumption and now make it a practice to never drink more than one beer at a time. Baby steps. 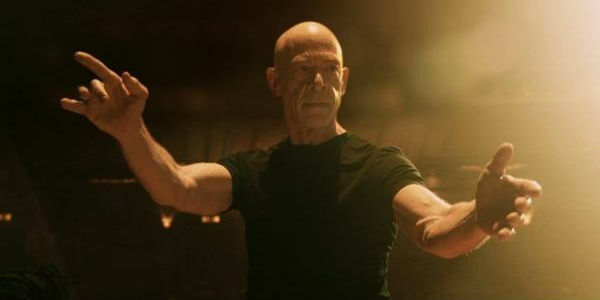 In “Whiplash” he is not given the option of blending in. He is front and center throughout the film as a brutally demanding teacher who will demean and manipulate anyone to get “his sound.” He was so good that he received the Academy Award for Best Support Actor and 4 other prestigious acting awards all for the same performance, one of only 11 actors to ever do so. J.K., I love you, man. I keep this picture above my desk as inspiration. Tomorrow I’m going to Target to get a fresh supply of black t-shirts, and just as soon as this endless writing exercise is done, I’m back at the gym. I promise.